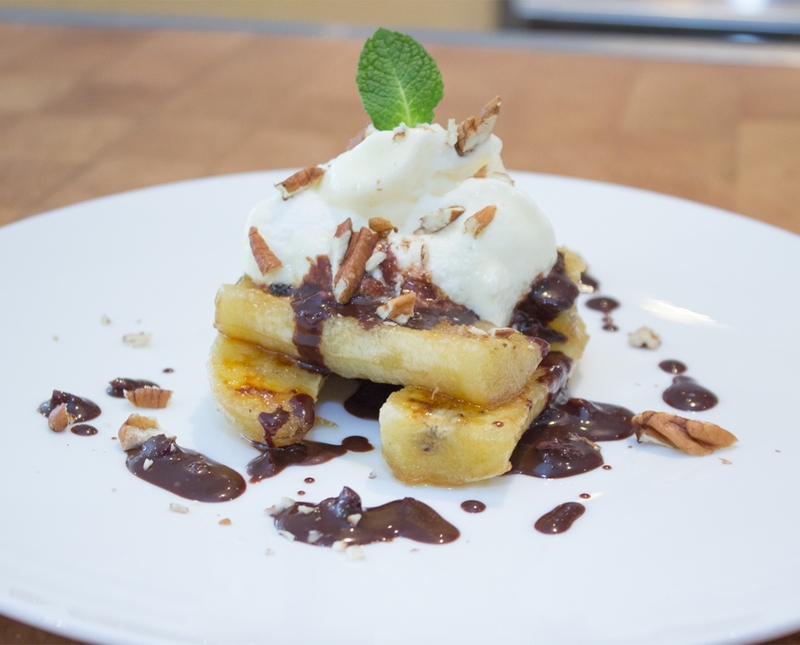 John’s tiramisu is prepared with mascarpone cream and served with caramelized bananas and topped with a warm chocolate and toasted pecan sauce, totally decadent! Break and separate egg whites and yolks in two bowls. 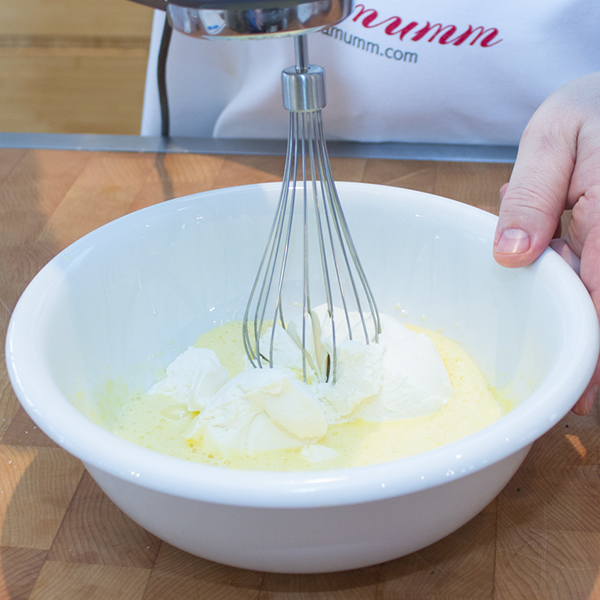 Add 40g of white sugar to the egg yolk and beat with a hand mixer. Add the mascarpone to egg yolk and beat until Smooth consistency. Set aside. Beat egg white with hand mixer. While beating, add the other 40g of white sugar. Beat until fluffy and stiff. 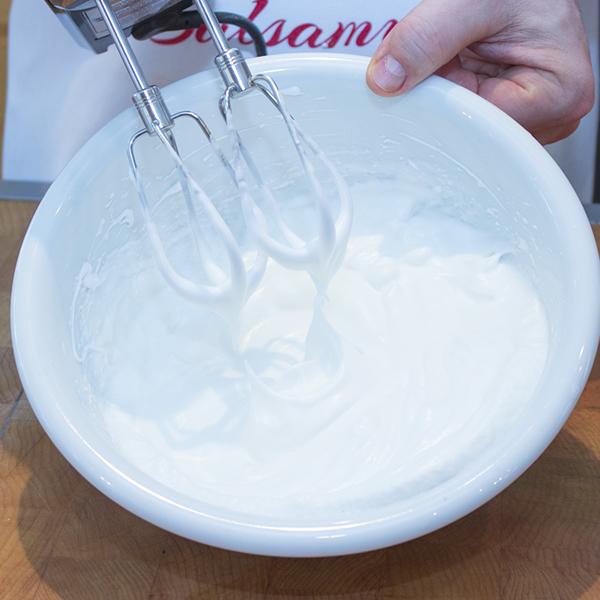 Tip: When you flip the bowl upside down, the egg whites should stay in place. Add 1/2 the egg white to the egg yolk mixture and gently fold in. Add the other half, but be careful not to over fold. Store in the refrigerator. 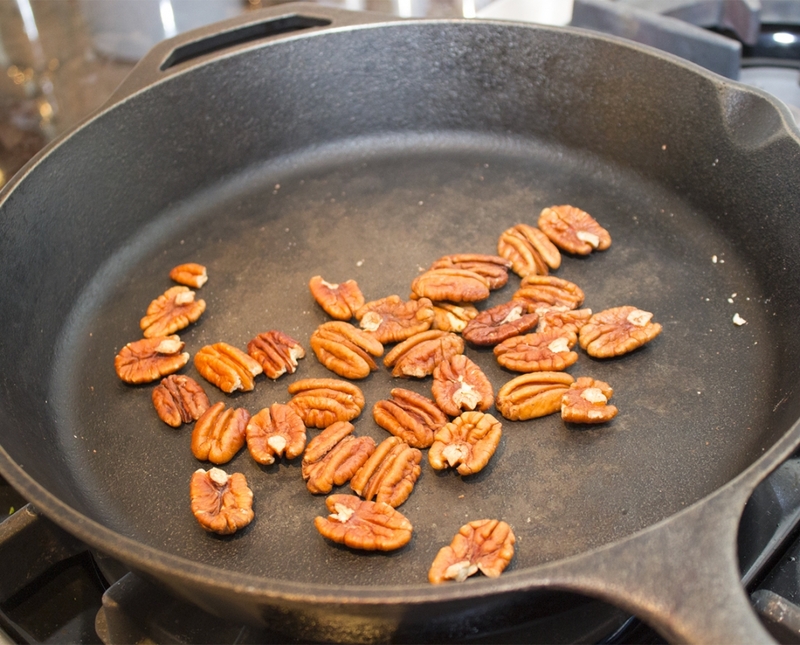 Toast pecans in a pan for about 5 minutes. Chop the pecans. 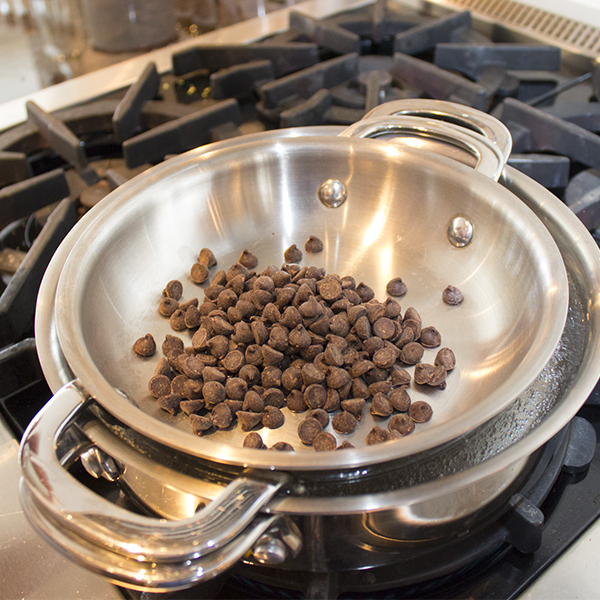 Melt the dark chocolate chips over a double boiler. Mix in the cream and butter. To avoid the chocolate sauce from hardening, add a little water too. 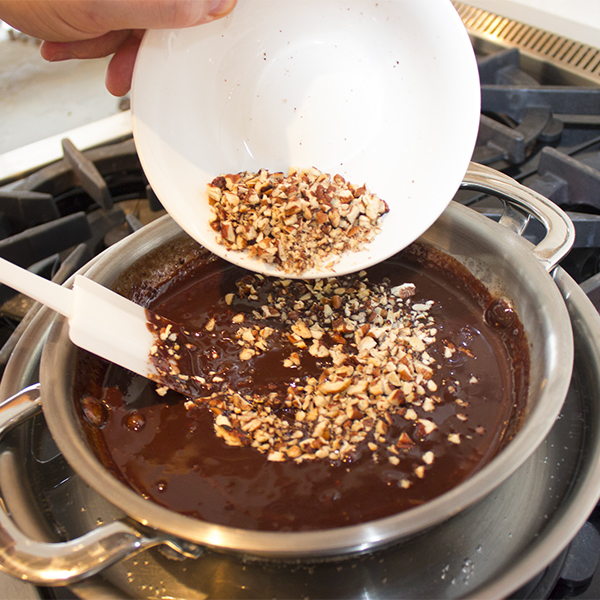 When chocolate is completely melted, stir in the chopped pecans. Reserve some pecans for garnish. Peel and cut the bananas in half vertically and horizontally. ** you should have 8 halves. 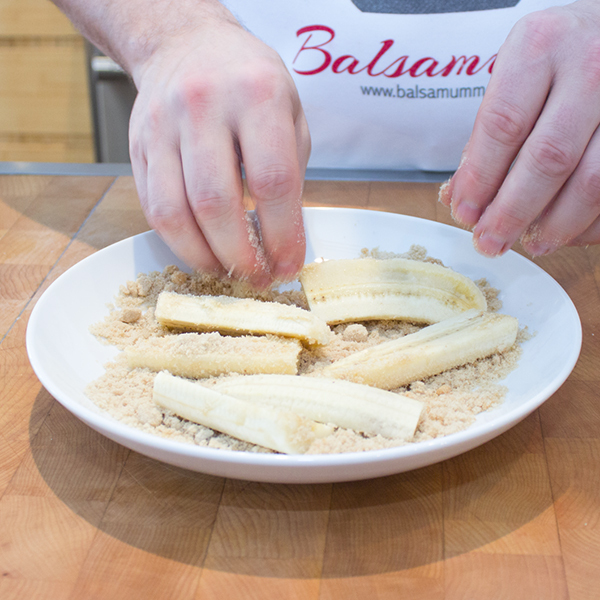 In a flat dish, coat the banana halves with brown sugar evenly. Transfer to a baking pan and bake for 2-3 minutes, until the sugar starts to bubble. 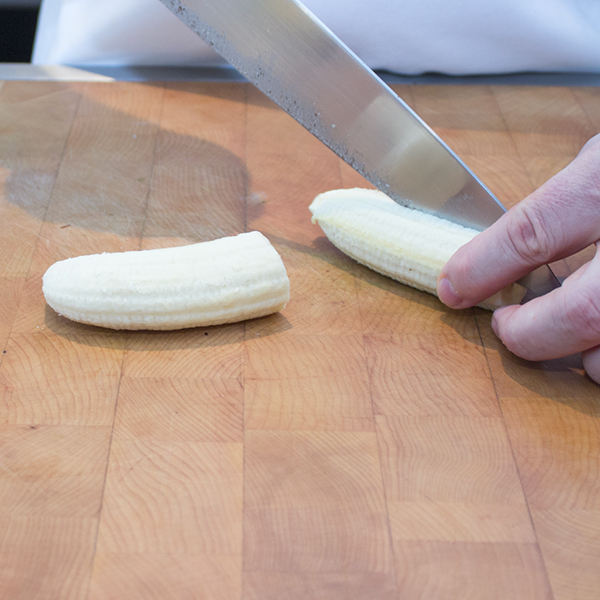 Place and mount 4 banana halves to each dish. 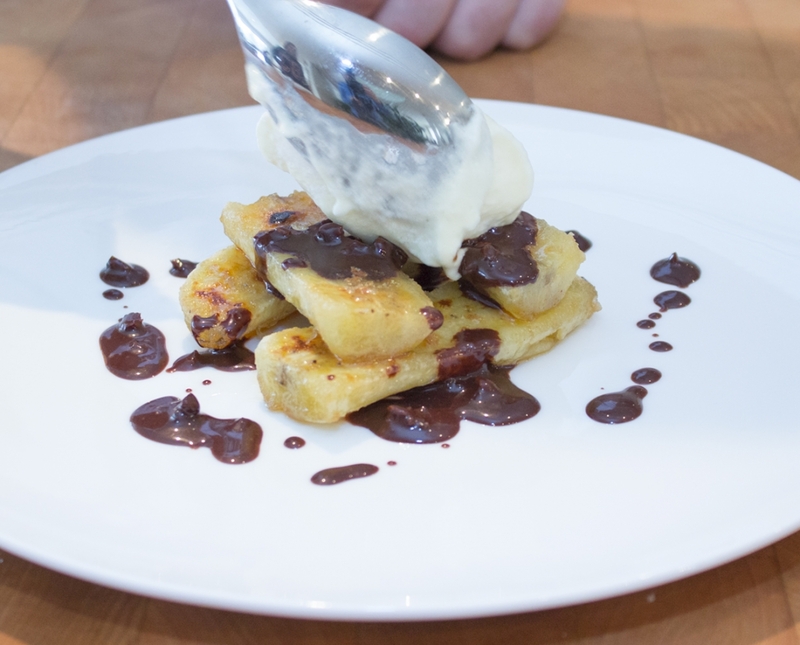 Add a few tablespoons of the chocolate sauce over the bananas. Dollop on the mascarpone cream. 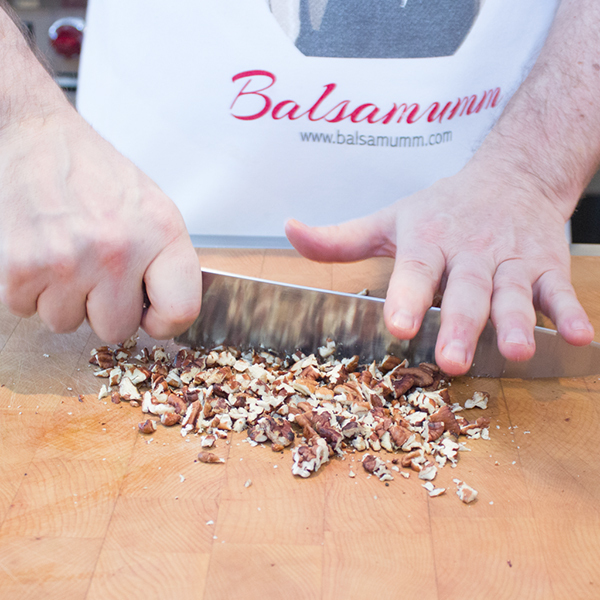 Add chopped pecans for garnish and enjoy! Tip While beating eggs white, when you add white sugar and beat until fluffy and stiff to know if you get the right constency, flip the bowl upside down, the egg whites should stay in place. Suggestion Replace bananas with your favourite fruit! 1 - Preheat oven on broil. 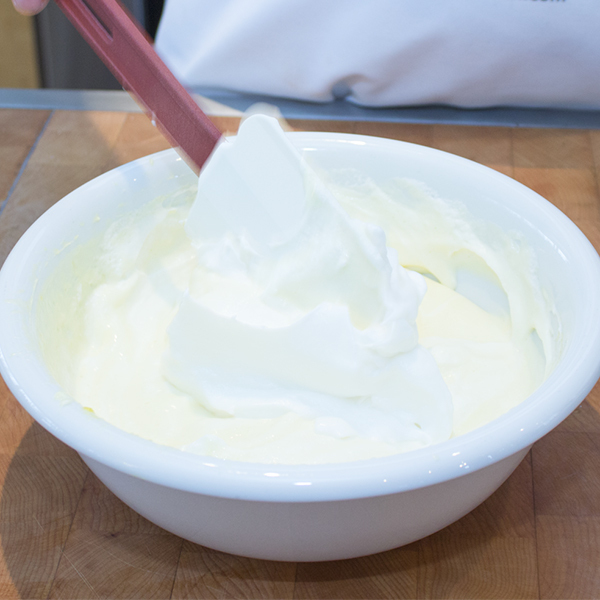 For the mascarpone cream—Break and separate egg whites and yolks in two bowls. 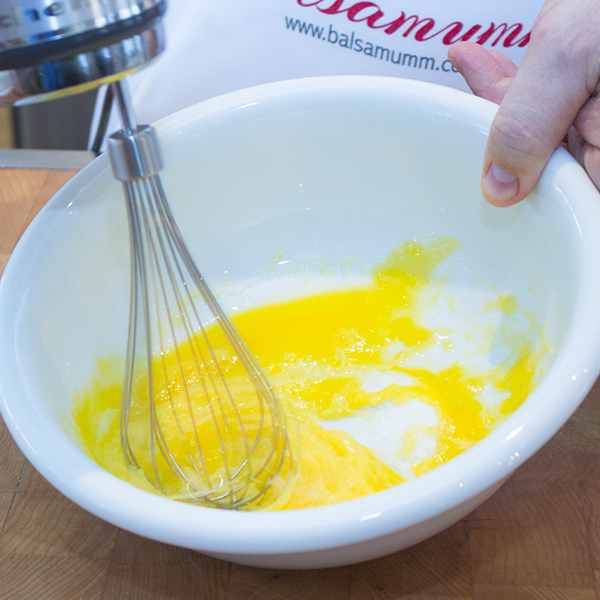 2 - Add 40g of white sugar to the egg yolk and beat with a hand mixer. 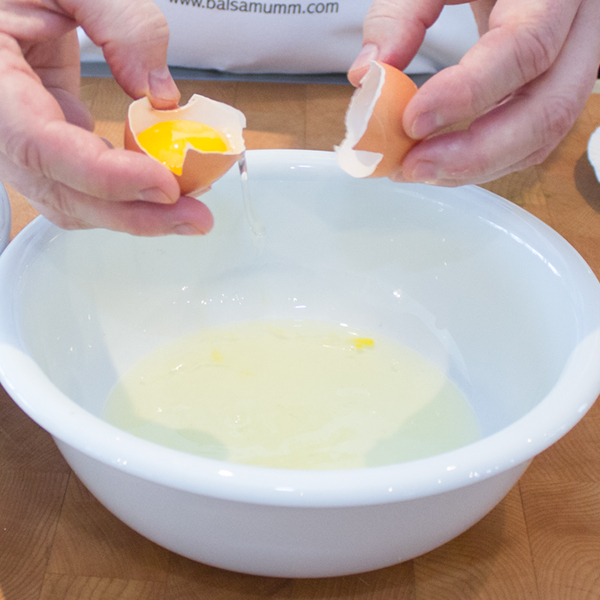 3 - Add the mascarpone to egg yolk and beat until Smooth consistency. Set aside. 4 - Beat egg white with hand mixer. While beating, add the other 40g of white sugar. Beat until fluffy and stiff. 5 - Add 1/2 the egg white to the egg yolk mixture and gently fold in. Add the other half, but be careful not to over fold. Store in the refrigerator. 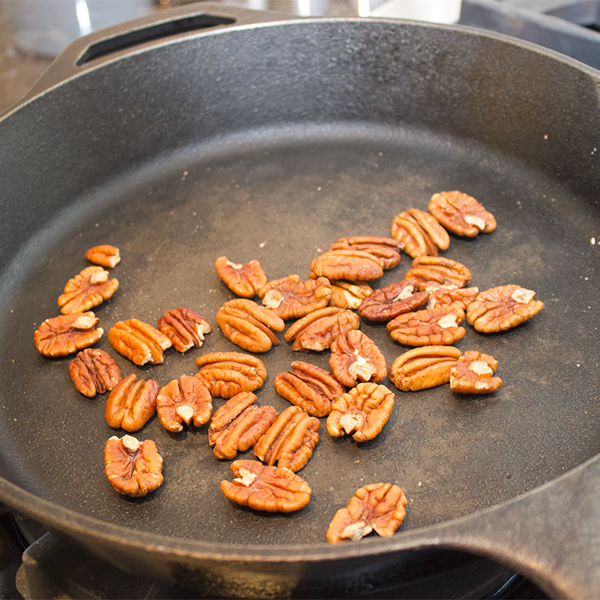 6 - For the chocolate sauce— Toast pecans in a pan for about 5 minutes. 7 - Chop the pecans. 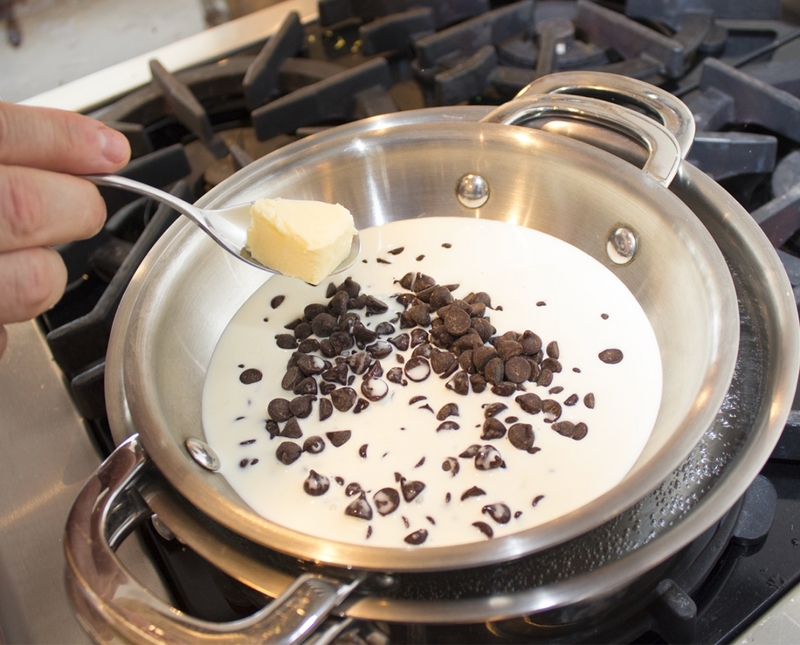 8 - Melt the dark chocolate chips over a double boiler. 9 - Mix in the cream and butter. 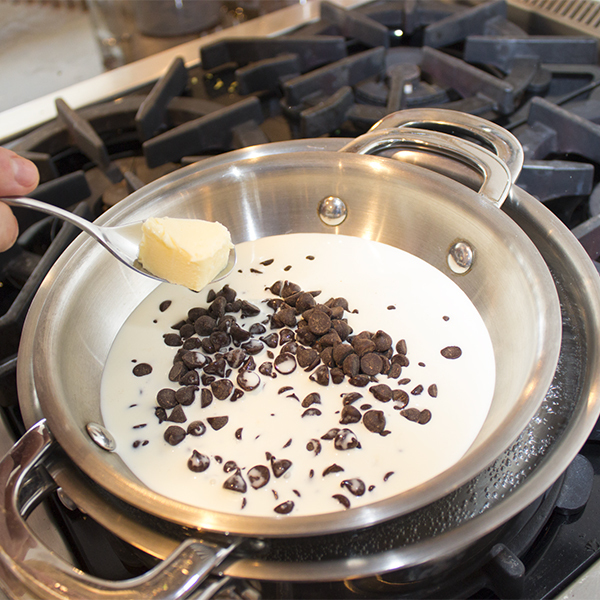 To avoid the chocolate sauce from hardening, add a little water too. 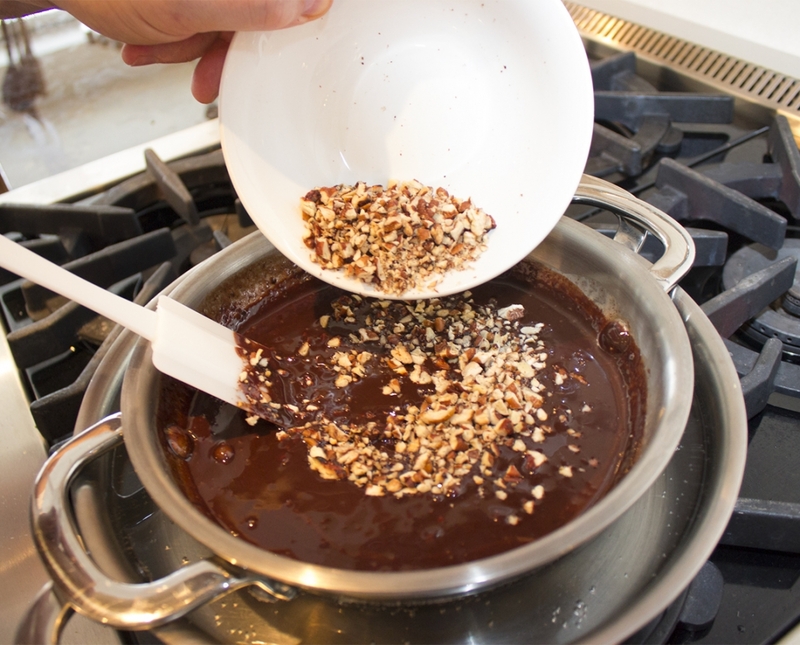 10 - When chocolate is completely melted, stir in the chopped pecans. Reserve some pecans for garnish. 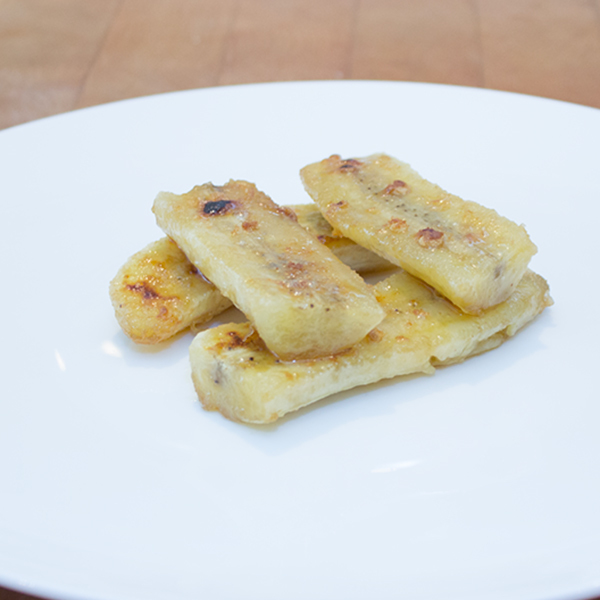 11 - For the caramelized bananas— Peel and cut the bananas in half vertically and horizontally. ** you should have 8 halves. 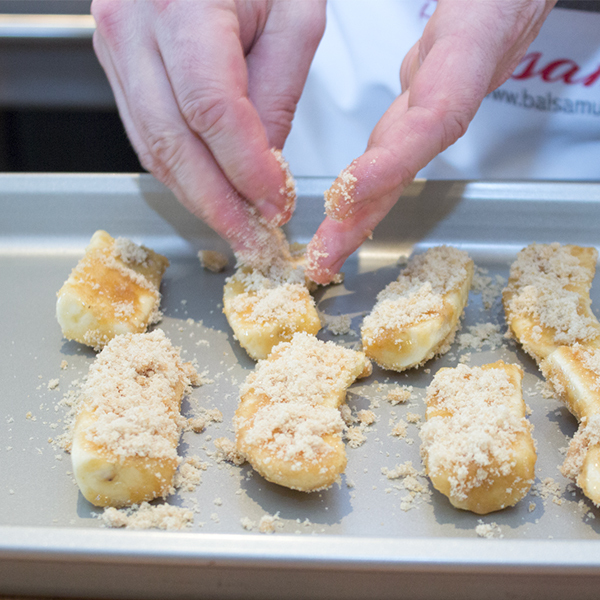 12 - In a flat dish, coat the banana halves with brown sugar evenly. 13 - Transfer to a baking pan and bake for 2-3 minutes, until the sugar starts to bubble. 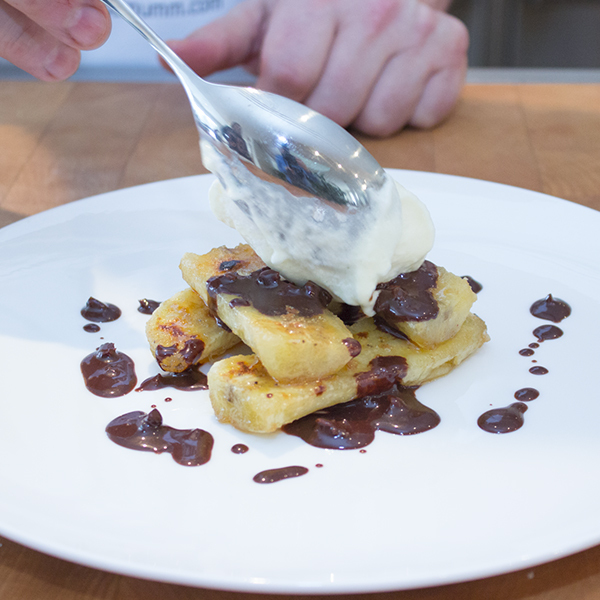 14 - Place and mount 4 banana halves to each dish. 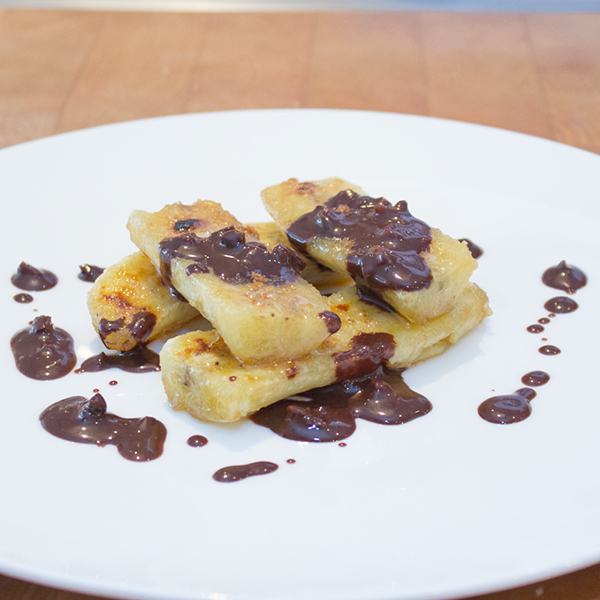 15 - Add a few tablespoons of the chocolate sauce over the bananas. 16 - Dollop on the mascarpone cream. 17 - Add chopped pecans for garnish and enjoy!